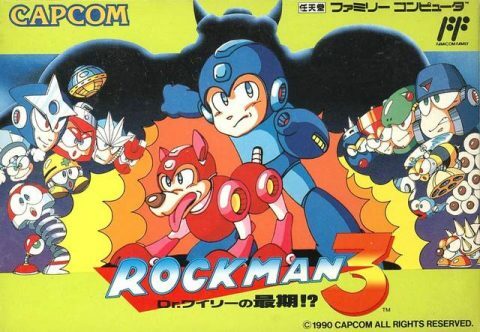 With the smash runaway hit that was Mega Man 2, Capcom and gamers worldwide were eager for more of the Blue Bomber. 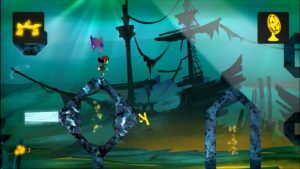 A sequel was put in motion, even after the lead supervisor quit the company and many of the staff from the last 2 games reassigned to work on other titles such as Ducktales. 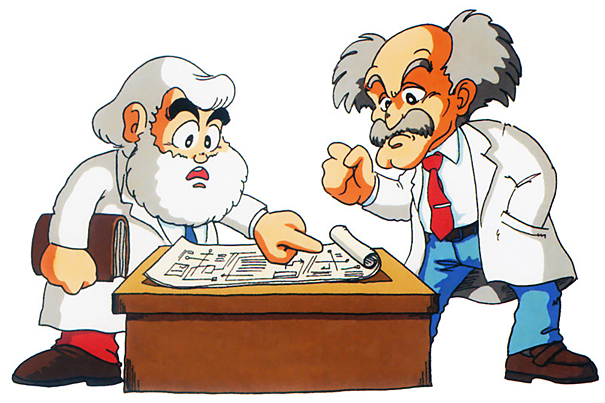 Dr. Wily seems determined to keep his promise of being a changed man this time, deciding to work with Dr. Light to build a giant robot that is supposed to maintain peace for all. All that is needed is 8 energy elements being held by 8 pesky robots hiding in 8 stages. Oh, and that one red robot of mysterious identity that’s popping up along the way. 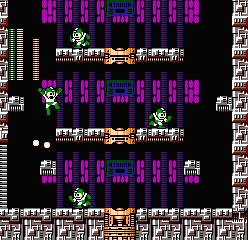 If that wasn’t enough, 4 of the stages have to be revisited with harder routes right after defeating all the Robot Masters, and it looks like these mass-produced superbots have the powers of all the bosses from the last go-around. 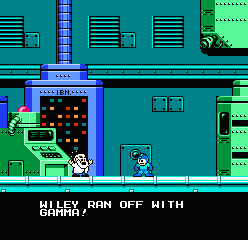 Then it turns out this was all done to stall Mega Man while Wily betrays Light and steals the fully-powered peacekeeper bot Gamma for himself. An overly complicated ruse? Yes! This game is also the only time Proto Man’s shakey alignment swayed more towards the evil side, as he had to work for Wily to fight Mega Man under the Sniper Joe-looking guise of Break Man as payment for the mad doctor fixing his energy core. A big, heavily-armed series of bots able to copy and utilize the powers and fighting styles of all the Robot Masters from Mega Man 2, at least one Master at a time. They’re designed to save on ROM memory that would be required for 8 additional bosses and their sprites. The name is a Japanese pun of “dokuro” meaning “skull”, not a nickname for their supposed academic grade. The quality of the 3rd game is highly contentious, especially compared to its masterful predecessor. Not in a terrible sense, mind you, but in terms in whether it lives up to Mega Man 2 in the eyes of its fans. It all comes down to what the sequel does and doesn’t have in comparison. The graphics are a bit brighter, for one, boasting lighter blues and greens and a lot more yellow. 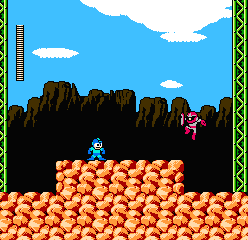 A new slide move gives Mega Man more speed and evasion. There are also low 1-block tall areas to utilize the ability to get past them, adding fun slide obstacles in the stage layout that appear less and less in the later sequels. 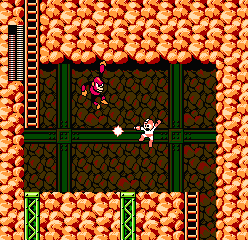 The game, for the most part, is fairer in difficulty overall, with fewer sudden spikes and hurdles to overcome as seen in sections of the Wily Castle in Mega Man 2. Rush brings a lot more personality than the previous items, and is a lot more versatile in movement. Big, impressive-looking enemies are much more frequent, with giant penguin shaved ice machines, striped cats, slithering snakes, and flying mega mets littering the game. Revisiting the stages expands the game’s scope, playing with the layouts from the first go around. And finally, Yasuaji “Bun Bun” Fujita’s compositions stand to rival the fantastic soundtrack of MM2. It’s not a perfect sequel, though. In many design choices, time and memory constraints, and the ambition of the project, it isn’t hard to find faults. While a rushed game, it isn’t nearly as buggy as obvious beta releases can be, but there is an air of unfinished polish in later stages, planned ideas that didn’t go fulfilled, and kinks in the system that were never fully ironed out. 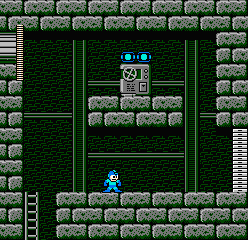 Certain platforms like the cloud step making machines in Snake Man’s stage or the red floating trap door platforms are a little ill-defined, likely to drop you off into bottomless pits if Mega Man doesn’t stand on them correctly. 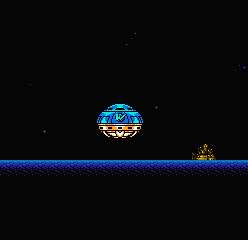 Slowdown is still and issue with big moving enemies and an overload of sprites, though there is slightly less flickering. 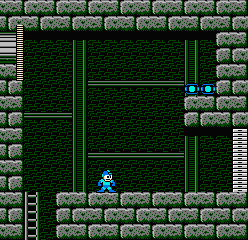 The added mappers for horizontally stationary menu sprites and more are not without graphical glitches, leaving blipping junk pixel lines on the stage selection screen, the moved to the bottom pause menu, and the floor where Mega Man fights the Wily Machine. 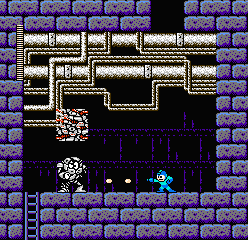 It’s also more apparent here that many levels were built before the Robot Master designs had been decided, with ill-defined links that make Top Man’s domain a glassy greenhouse and have Needle Man lording over a ship-like lair, not to mention wherever and whatever Gemini Man’s flashing crystally stage is. 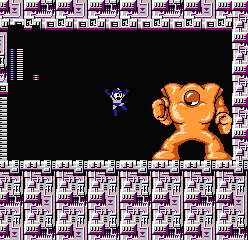 The weapons earned from the Robot Masters are not that useful compared to Mega Man 2‘s selection, though on the flipside none are as overpowered as the Metal Blades. Needle Cannons are merely rapid-fire standard shots in strength, and Spark Shots only incapacitate enemies and renders them indestructible until their paralysis wears off. 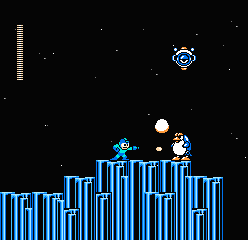 The Top Spin in particular is difficult to manage, as Mega Man is unable to use it whilst standing. 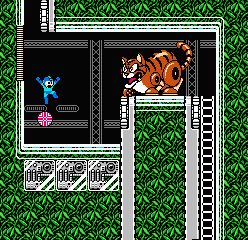 The player has to carefully tap to use it without eating away chunks of the ammo or even damaging or killing Mega Man in the process. In the hands of a trained player, it can be deadly, but it is a skill that has to be mastered. The added question mark Mystery Tanks are rarely sprinkled in the game, yielding little rewards. 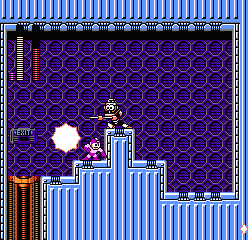 Rush Jet can be exploited just as much as the Metal Blade from Mega Man 2, though. The robo dog is fully controllable, able to hover in place and fly anywhere, even underwater, enabling it to also serve the same purposes as Coil and Marine. 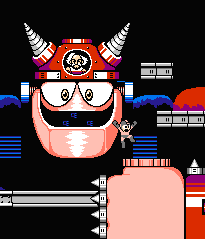 Bunny hopping on the Jet lessens the energy consumed while riding on it, and a menu bug involving the Shadow Blade can make it accessible before earning it by defeating Needle Man. 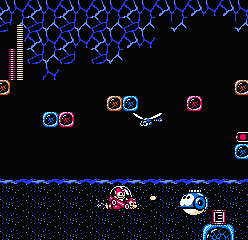 Even outside of the segments that require the use of Jet mode, there are plenty of areas where it’s useful to whip the pooch out to fly above enemies and obstacles or hover right in line with aerial weakspots. The biggest stickler is the set of Doc Robot stage retreads. 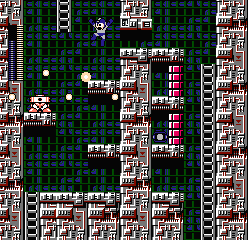 Even with the ROM expanded to 3 megabits, only 4 of the levels are replayable: Spark, Needle, Gemini, and Shadow. 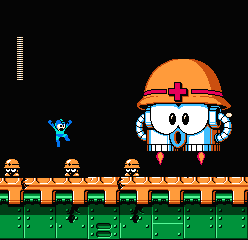 Signs of a planned return to Magnet Man’s stage lie dormant in the code, but it appears squeezing 4 more revamped layouts proved too much to fit in. 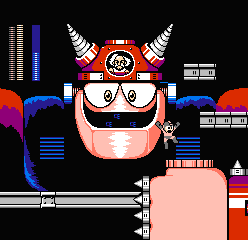 The Doc Robots themselves are a memory compromise, larger imposing sprites with little movement to them to avoid having to stuff back in every boss sprite from the previous game. Their greater size also comes at a challenging cost to the battles. It is much harder to leap over the Doc Robots and many of their attacks unscathed. The Wood Man clone is especially difficult, since it requires pixel-perfect precision to hop over the wider Leaf Shield with little warning of it being launched. 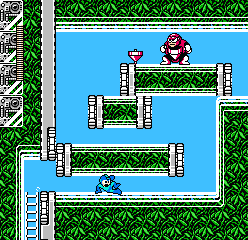 Having to fight two Robot Masters per level with little in the way of health pickups to aid Mega Man, makes these the hardest sections of the game. 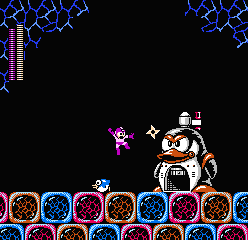 It is possible (though not likely) to get stuck in Doc Robot Gemini Man’s stage after fighting Flash Man, with no means to get out, prompting a reset. 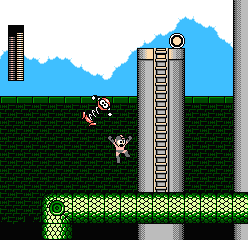 The worst would have to be the Rush Jet segment in the second half of Needle Man’s revisited stage right after a tough slog past Air Man. 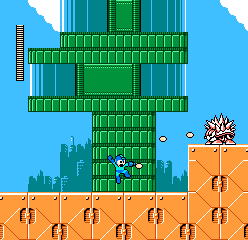 It requires picking up weapon refills along the long flight, which don’t regenerate should Mega Man perish before the stage is over. In contrast, the Wily Stages are much more of a breeze, with the mad doctor’s interiors housing a skeleton crew of baddies and plenty of pickups, particularly E-Tanks aplenty. The game itself boosts the E-Tank reserves from 4 to 9, with passwords keeping the count along the way. It is possible to down three Tanks in one fortress boss battle and pick up two or three more in the next stage, making it easy to bulldoze through the last levels while chugging the energy refillers on the go. 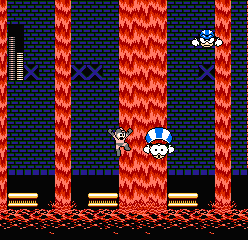 It is likely that the enemy layouts in Wily’s Castle weren’t finalized until just before the game went gold, given the sparse placement. 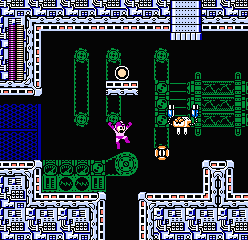 At least there isn’t a boss as infuriating as the Boobeam Trap from Mega Man 2. If anything, the fortress almost feels like a return to the first game, with a new Yellow Devil and Mega clones to fight. The fortress itself houses 6 stages in total, though many of them are quite short – the final two are merely two or three screens wide. The final boss Gamma is a screen-filling monster with a huge instant-kill spike punch, though one rightly timed Top Spin is all it takes to take the giant down. 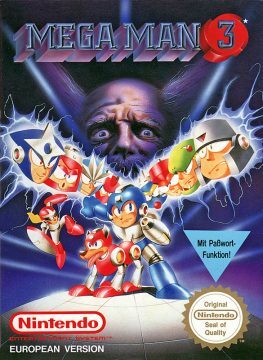 The climax ends with heavy blocks crushing Wily and Mega Man, a shadowy Proto Man saving the Blue Bomber, and Dr. Light finding out the strange red robot’s identity. Is Dr. Wily finally finished? If he is, then what’s that tiny blue UFO-looking sprite doing in the background before the ending credits…? Yep, you can’t keep a bad doctor down for long. 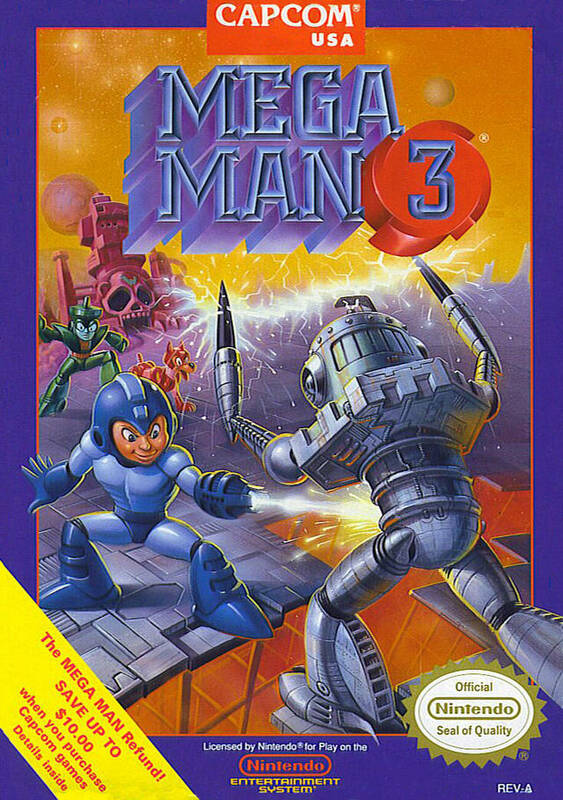 Mega Man 3 boasts a lot of unused and beta material on the final cart, the most of all the NES titles. To start with, the game was shipped with debug commands still in. 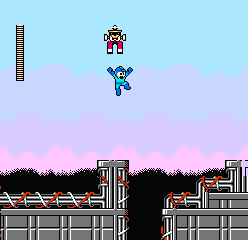 Holding Right+A on the second controller makes Mega Man leap super high, able to launch out of bottomless pits. 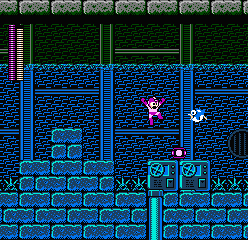 Holding Up+A freezes the logic timer and locks enemy AI in its current state. Both of these can be used to further cheat through the game. 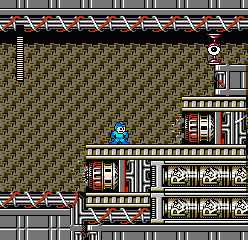 There are plenty of sprites on the ROM, from a flashing ringed planet for Gemini Man’s nighttime background to trash heaps in Spark Man’s stage data to unmasking animations of Proto Man removing his Break Man persona. 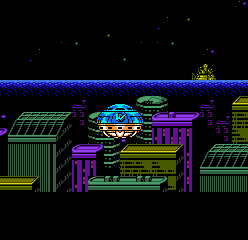 There are also alternative cutscene backgrounds for Wily’s UFO takeoff before the Wily Fortress, as well as two songs that never get played in full: the Wily Fortress Map music only plays the first 4 seconds of its total 18 second composition, and the ending Proto Man whistle theme cuts out prematurely, never reaching its loop routine. Three sound effects are also left unused. Do these flaws hurt the game? Not seriously. The title is by no means broken and is still highly polished in many areas while trying to expand the series in gameplay and length. 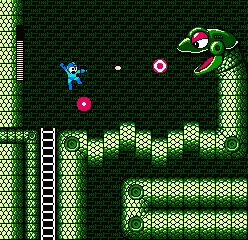 For many fans, Mega Man 3 edges out its predecessor as the best in the series, warts and all. More commonly, though, the game is seen as the second best; but being the silver medalist in this franchise is still a triumph. The bigger tipping point for the series wouldn’t arrive until next year’s installment. 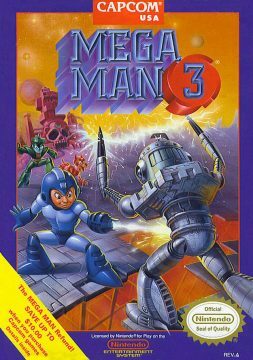 Outside of the standard ports released, Mega Man 3 is the only game in the series available as part of Nintendo’s Playchoice-10 arcade machines. The game is the same as its original NES edition aside from slight palette differences with the RGB output and the additional PC-10 hint and info screens on a seperate monitor or brought up at the touch of a button. The game is also played on a timer just like every other released title for the arcade machine, requiring additional quarters to keep playing even if the player doesn’t lose a single life. The earliest mobile phone ports were relatively intact, though a few traps like the disappearing blocks in Magnet Man’s stage and spinning gears in Spark Man’s stage toned down for ease of play on the old phone setups. 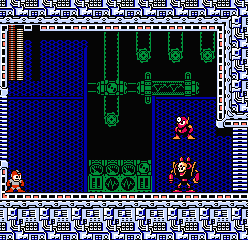 Stages could be replayed as often as the player wished and Proto Man’s sprite is in the Break Man disguise throughout the game. The Rush Drill didn’t make it into the game.